Grapevine’s 9th Annual SummerBlast is in full swing now through Labor Day! Discover fun for the whole family including water parks, fireworks, interactive exhibits, outdoor adventure and more. We want to make sure your family doesn’t miss one laugh, cannonball or memory making moment, so we’ve compiled the Top 9 Grapevine Summer Bucket List. 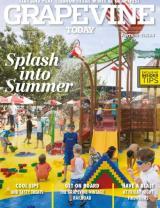 Dive into summer fun at Grapevine’s many water parks. Home to the largest indoor water park in North Texas, a newly renovated 10-acre Paradise Springs and even a Pirate-themed LEGO® water park, discover them all here. Catch the 11-minute Friday Night Fireworks spectacular reflecting over Lake Grapevine every Friday now through Labor Day starting at 9:30 p.m. Sure to dazzle and delight, firework shows are scheduled for June 23 and 30; July 4, 7, 14, 21 and 28; August 4, 11, 18 and 25 and September 1. Insider tip: There are a variety of viewing areas throughout Grapevine. Head to Grapevine’s parks or the Gaylord Texan Resort for their All-American Garage Party. This weekly event starts at 7 p.m. on the fifth floor of the Resort Parking Garage and feature live music, food and a DJ hosting fun and games. Some fees may apply. Travel back in time on the Grapevine Vintage Railroad. The 1920s Victorian-style coaches will transport riders of all ages on this historic railroad. Don’t miss the Grapevine to Fort Worth Stockyard Excursion on Fridays, Saturdays and Sundays or the Grapevine Fun Train on Saturdays. Find the perfect ride for your schedule and purchase tickets here. Explore the amazing world of the Octonauts, the team of undersea adventure heroes from the hit animated TV series, with The Ultimate Octonauts Experience. Take part in underwater missions to save the world’s oceans, while getting up-close with new and exciting sea creatures that include lionfish, hawkfish, angelfish and more. Join Senswi Wu and put your ninja skills to the test in the all-new-two story LEGO Ninjago City Adventure with more than 20 interactives. Practice your ninja moves in the Aiurjitzu temple and Dojo training room, then ninjas-in-training can take on obstacle course challenges alongside their favorite Ninjago character. Discover Western lore right in the heart of Grapevine! Grapevine’s Glockenspiel Clock Tower features two, larger-than-life, 9-foot tall Glockenspiel characters, known as the Would-Be Train Robbers, Nat Barrett and Willy Majors. Approximately 75 feet above ground, these figures emerge from the Tower at 10 a.m., 12 p.m., 2 p.m., 4 p.m. and 6 p.m. daily to attempt a lucrative train heist. Celebrate America’s birthday at the 35th Annual July 4th Fireworks Extravaganza. The exciting, 26-minute firework spectacular is set to patriotic music and is the perfect way to celebrate the fourth. Fireworks begin at 9:30 p.m. Celebrate Grapevine’s railroad past, present and future at the new “Grapevine Rails: Rolling Through Time” exhibit in Grapevine’s Tower Gallery. The exhibit showcases the fascinating ways the railroad impacted the growth of Grapevine from a farming community in the 1840s to the world class destination it is today, as well as the continuing evolution of transportation with TEXRail. Hear stories from the early days of steam rail and discover the Lone Star Hi-Railers Club 1,000 square-foot O-gauge model railroad display. Younger visitors can step back in time and play in the train yard featuring a replica of the Grapevine Vintage Railroad and the Grapevine Cotton Belt Depot. The free exhibit is open now through September 17, Monday - Friday, 8 a.m. – 5 p.m., Saturday 10 a.m. – 6:30 p.m. and Sunday, noon – 5 p.m. Enjoy a classic film at the historic Palace Theatre most Fridays and Saturdays. Check what’s playing this weekend here. Insider tip: Enjoy dinner along Main Street and bring your same-day receipt from any Grapevine restaurant to receive a free small popcorn.